STOCKHOLM (AP) — An American researcher who shared this year’s Nobel Prize for medicine bluntly criticized political developments at home in his address at the awards’ gala banquet Sunday night. 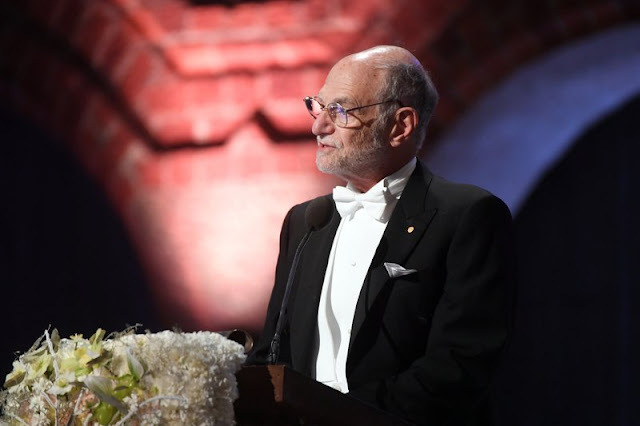 Michael Rosbash, who was honored for his work on circadian rhythms — commonly called the body clock — expressed concern that U.S. government support such as that received by him and colleagues Jeffrey Hall and Michael Young is endangered. “We benefited from an enlightened period in the postwar United States. Our National Institutes of Health have enthusiastically and generously supported basic research ... (but) the current climate in the U.S. is a warning that continued support cannot be taken for granted,” he said in a short speech at the ornate city hall in Stockholm. Literature laureate Kazuo Ishiguro of Britain expressed concern about increasing tensions between social factions. “We live today in a time of growing tribal enmities of communities fracturing into bitterly opposed groups,” said Ishiguro, who was born in Japan. He said Nobel prizes can counterbalance such animosity. “The pride we feel when someone from our nation wins a Nobel prize is different from the one we feel witnessing one of our athletes winning an Olympic medal. We don’t feel the pride of our tribe demonstrating superiority over other tribes. Rather it’s the pride that from knowing that one of us has made a significant contribution to our common human endeavor,” he said. In the Norwegian capital of Oslo, a survivor of the atomic bombing of Hiroshima compared her struggle to survive in 1945 to the objectives of the group awarded this year’s Nobel’s Peace Prize. Setsuko Thurlow, who was 13 when the U.S. bomb devastated her Japanese city during the final weeks of World War II, spoke as a leading activist with the Nobel-winning International Campaign to Abolish Nuclear Weapons. Thurlow said the Hiroshima blast left her buried under the rubble, but she was able to see light and crawl to safety. In the same way, the campaign to which she belongs is a driving force behind an international treaty to ban nuclear weapons, she said after ICAN received the Nobel prize it won in October. The treaty has been signed by 56 countries — none of them nuclear powers — and ratified by only three. To become binding it requires ratification by 50 countries. “This is the way forward. There is only one way to prevent the use of nuclear weapons — prohibit and eliminate them,” Fihn said. The prize winners were announced in October. All except the peace prize were awarded in Sweden on Sunday. The other laureates were American Richard Thaler for his work in behavioral economics; American physicists Kip Thorne, Rainer Weiss and Barry Barish for confirming the existence of gravity waves; and Jacques Dubochet of Switzerland, American Joachim Frank and Richard Henderson of the United Kingdom for advances in electron microscopy. 0 Response to "US Nobel laureate worries politics could undermine science"